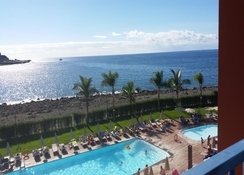 Nestled on the beautiful island of Gran Canaria are the Cura Marina II Apartments. The apartments and studios in the complex decorated in a simple and functional style offer cosy accommodation to all its guests. The guestrooms come equipped with a kitchen, private bathrooms, a living area and internet connection. The aparthotel also features an outdoor swimming pool and a solarium, where you can relax in the sun. The onsite spa will definitely help in relaxing and relieving stress. Guests of the aparthotel can avail the shuttle service offered. The apartments also feature a games room fitted with a billiards table and other such indoor sports. The area around the apartment is known for being a golfing hotspot. Cura Marina II enjoys a beachfront location in Playa del Cura. 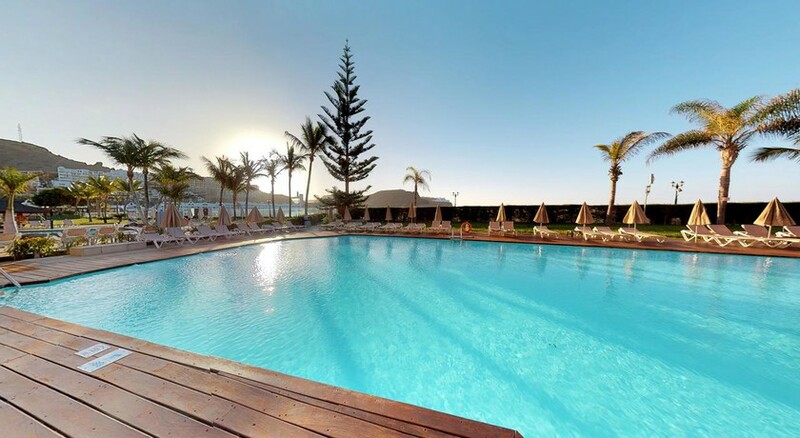 The picturesque towns of Maspalomas, Playa de Ingles are 19.5km and 23.4km respectively. Puerto de Mogán is about 17km from the hotel. Other points of interest that guests can visit during their time at Cura Marina II Apartments are Maspalomas lighthouse at 19km and Las Burras beach at 23km from the property. The Cura Marina II Apartments, as the name suggests, features 99 apartments and studios. These cosy apartments have a rather homely feel to them. Being a beachfront property, the apartments let in a lot of sunlight. The air-conditioned guestrooms come with a living room, private bathroom and kitchen equipped with a flat screen TV, sofa bed, bathtub or shower, hair dryer, coffee & tea maker, fridge, cookware and stovetop. Free Wi-Fi is available in all the guestrooms. Cura Marina II offers a fully equipped kitchen where guests can cook meals of their choice. Additionally, there are several restaurants and bars to discover in the neighbourhood. Get a taste of authentic Mediterranean cuisine and delicacies made with fresh ingredients at the Vistamar Restaurant. Guests can also enjoy international cuisine at The House Fusion. Well known bars in the area include The Old Brogue, The Lola Ville among others. Cura Marina II has a game room fitted with a billiards table and other such indoor games. The area around the hotel is known to be a golfing area – make sure you swing by to any of the golf courses nearby to putt a ball or two. 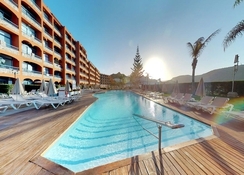 The hotel’s outdoor pool and solarium let you have a relaxing swim or simply laze or work on a tan! The balmy and enjoyable weather on the island helps in having a fun day at the beach, which isn’t too far from the hotel. The property also offers massage services and an airport shuttle service.